Overgrow Powers up Grass-type moves in a pinch. "When this Pokemon's HP is 1/3 its max or lower, its Grass moves do 50% more damage." Leaf Guard* Prevents status problems in sunny weather. This Pokemon is immune to major status effects during Sunny Day. of its becalming scent to blunt the foe�s fighting spirit. Emerald The fragrance of a MEGANIUM�s flower soothes and calms emotions. In battle, it gives off more of its becalming scent to blunt the foe�s fighting spirit. FireRed MEGANIUM�s breath has the power to revive dead grass and plants. It can make them healthy again. Leaf Green The aroma that rises from its petals contains a substance that calms aggressive feelings. Diamond/Pearl Its breath has the fantastic ability to revive dead plants and flowers. Heart Gold The aroma that rises from its petals contains a substance that calms aggressive feelings. 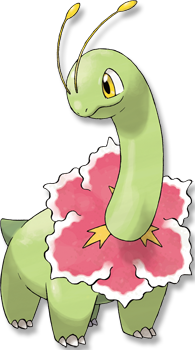 Soul Silver MEGANIUM�s breath has the power to revive dead grass and plants. It can make them healthy again. White Its breath has the fantastic ability to revive dead plants and flowers.